Uni Woodnote 0.38mm Gel Pen Review ….OUCH! 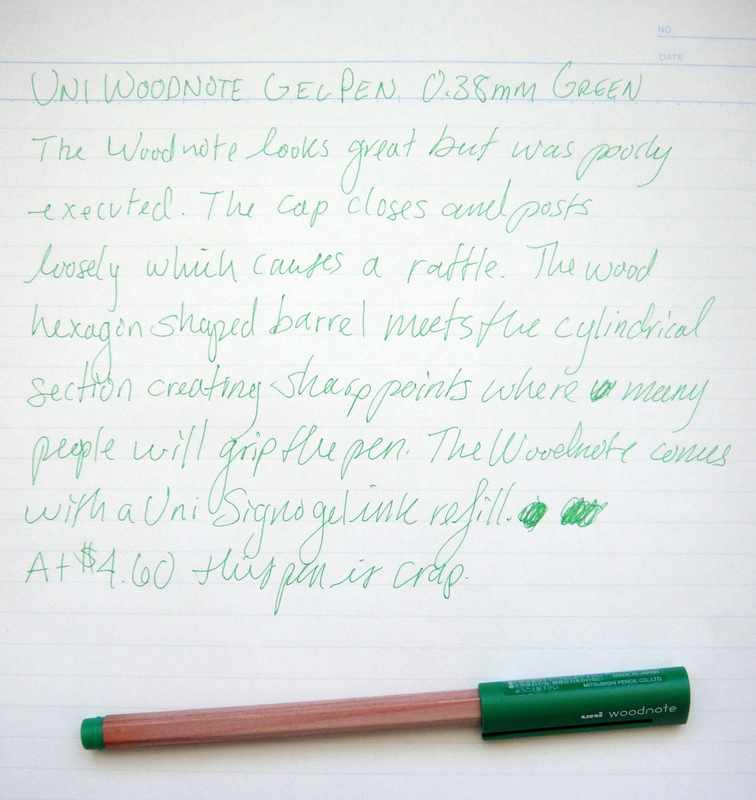 The Uni Woodnote has a body made of North American cedar that is the same width and shape of a wood pencil, together with a bright green cap the pen looks fantastic. The Woodnote uses a Uni Signo gel ink refill and can take refills from the Uni Style Fit Multi Pen System so there are a lot options. Everything sounds great right? WRONG! This the only pen that I can think of that is actually painful to simply hold. You have to be careful where you grip the pen because there are sharp points where hexagon body meets a cylindrical plastic section. The cap is loose when the Woodnote is capped and posted; this creates an annoying rattle. Take the cap off and you can hear the refill rattling in the body as well. The Woodnote is not a heavy pen by any means at 5.5 grams but it is too heavy to feel like a wood pencil. The Uni Signo 0.38mm refill is good quality and writes well for such a small point but considering the Woodnote is painful to use and costs $4.60 you would have to really like the pencil shape and/or pain to have a use for this thing.